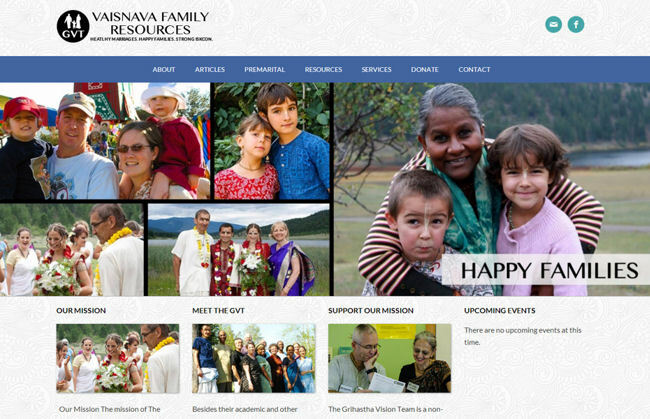 Vaisnava Family Resources - Perfect for Family Day! ~ The Toronto Hare Krishna Temple! Vaisnava Family Resources - Perfect for Family Day! One of the most amazing resources we have in our Hare Krishna movement is the Grihastha Vision Team (GVT) - an incredible group of senior devotees who dedicate themselves to helping our Hare Krishna communities become stronger by developing strength in families. Being Family Day weekend, this seems like the most opportune time to "plug" the work of the GVT. The mission of the GVT is to support, strengthen, educate and enliven the individuals, couples and families who are or will be involved with the grihastha ashram (family life). The GVT has a goal of wanting to help you spiritualize your marriage and make it an act of seva (service). An important goal for them is to help each person about to marry, to receive premarital education. The best way to do that would be through one of their team members or trained mentor couples. Marriage mentoring has been proven to raise the success rate in marriage and result in more connected and happy couples. Feel free to check out the Grihastha Vision Team's great website by clicking here or by clicking the image below!